Anna Kendrick has five movies out this year, and though her onscreen adventures have seen her meet Mr. Right and Get A Job, they haven’t included a foray into the Marvel Cinematic Universe. (They do, however, include the unenviable tasks of trying to outbro Zac Efron and hanging out with Ben Affleck.) But Kendrick, whose chipper voice can be heard in the upcoming Trolls, is already remedying that. In a new interview with Net-A-Porter, the Pitch Perfect trilogy actress goes ahead and casts herself as Doreen Green, a.k.a The Unbeatable Squirrel Girl. 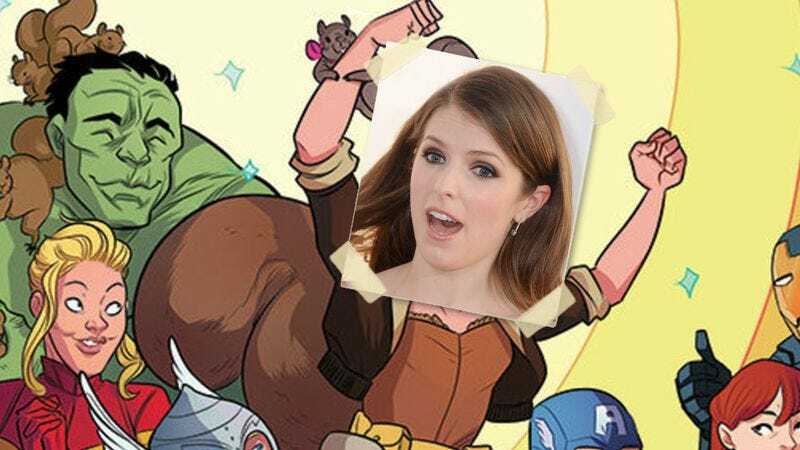 It seems Kendrick recently came into possession of a Squirrel Girl comic, and while she doesn’t really “know what Squirrel Girl does other than be half squirrel,” she’s still prepared to portray one of Marvel’s lesser-known heroes. “I could be half squirrel!,” Kendrick generously offers, to whomever might direct the ensemble or standalone film that stars the character, if such a project ever comes into existence. She’d probably be even more excited about taking on the character if she knew that Doreen is part Dr. Dolittle, part Wolverine. Marvel did apply for a Squirrel Girl trademark about two years ago, but there’s been no further development, nor any word about what kind of project is even in the works.